Yesterday was one of those days when nothing could stop me from cooking the food I crave for. Though I've always been hesitant to make kalamay because of the long cooking time and all the stirring that goes with it, I gave it a shot. Wondering what Kalamay is??? 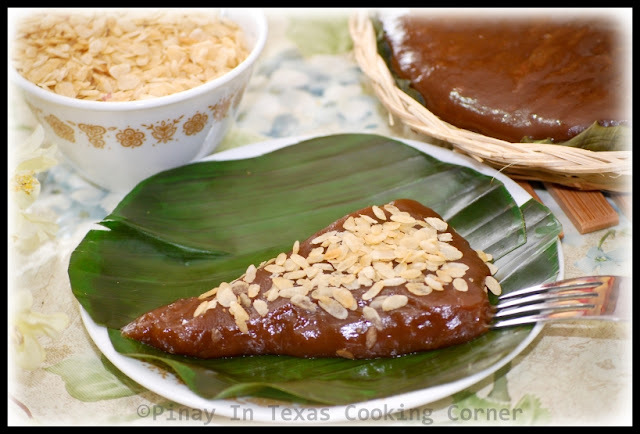 Kalamay is another favorite sticky rice-based kakanin (sweet delicacy) in the Philippines. It basically has the same ingredients as the espasol, but they differ in the manner of preparation and cooking. 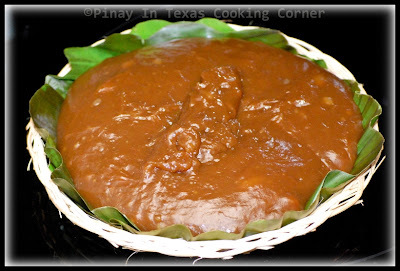 Kalamay comes in the form of a very sticky brown paste, although other colors in less viscous versions also exist. It actually has different versions, consistency, packaging and texture depending on location. In Bohol, it is spelled "calamay" and is sealed inside hollowed-out coconut shells. In Tarlac, on the other hand, it is called "nilubyan" and green rice is used. In Baguio, they call their kalamay, "kulangot" (Tagalog word for snot). Kulangot is usually packed in smaller sago shells to further the playful image. In other regions, flavors are added to their kalamay to make it distinct from traditional preparations. In Mindoro, for example, locals add peanut butter to the paste, while others add grated coconut meat. Historians have difficulty pinpointing kalamay's exact origins because of it's wide variety of preparations. 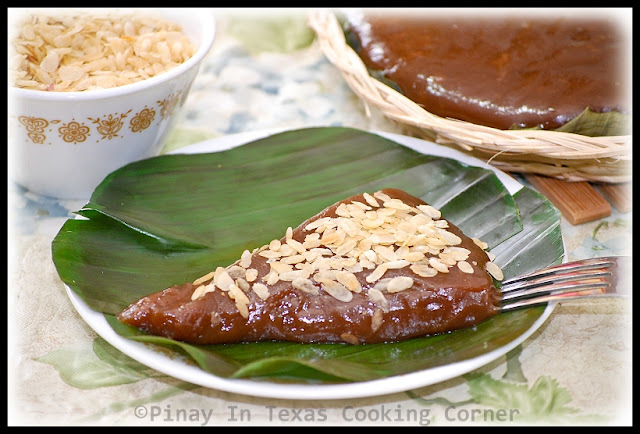 While the use of coconuts and rice is a clear indicator of traditional Philippine cuisine, similarities in preparation lead some food historians to believe that it an adaptation of the Chinese nian gao, a rice dish commonly served during the Chinese New Year. 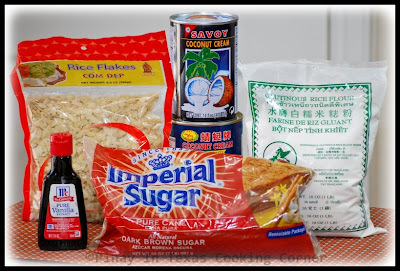 Though names and recipes for kalamay vary from region to region, the base ingredients are consistently the same: glutinous rice, coconut milk and brown sugar. I grew up with the simplest version of it - dark brown, sticky and a bit chewy, very fine textured 2 cm thick triangles wrapped in banana leaf...and that's what I love the most! It has been 4 years since I last had kalamay, and I was badly craving for it yesterday. I had all the basic ingredients in my pantry, so I really don't have any reason to simply ignore my craving! Though the Kalamay I grew up with had latik (fried coconut milk curd) on it, I thought that crunchy pinipig (rice flakes) will work well on it...and it did! It took me more than an hour to cook it. My arm got so tired with all the stirring...but it was all worth it! I satisfied my craving and I was able to prove that I can make my own homemade kalamay! 2. Add glutinous rice flour. Cook in medium low heat. Keep stirring until mixture thickens. You'll know it's thick enough when you can hardly stir it. It will take approximately 45 minutes to 1 hour. 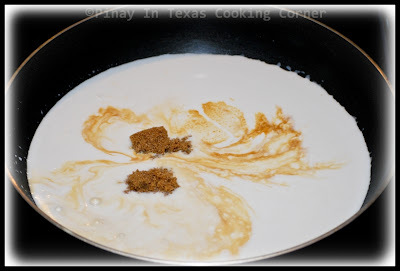 Be sure to stir constantly to prevent mixture from sticking to the bottom of the pan. 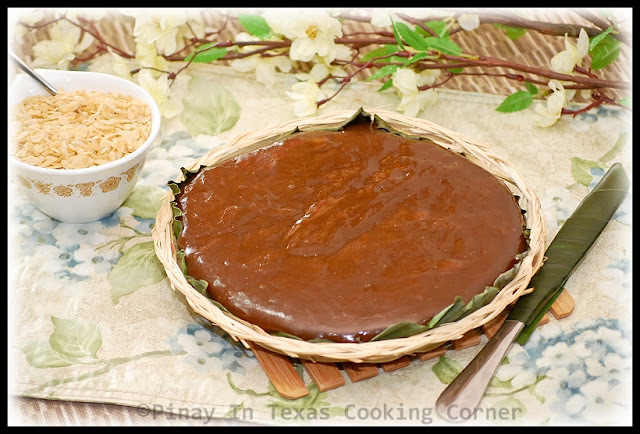 The secret to a thick and sticky kalamay is to cook it in low heat with constant stirring. In 30 minutes, the mixture is already cooked...but for a more sticky and chewy consistency, you can go as long as 1 more hour of stirring. I just did 30 minutes more. 3. Take off from heat and transfer to a plate covered with banana leaves. If you don't have banana leaves, you can just slightly grease the plate to avoid the kalamay from sticking. 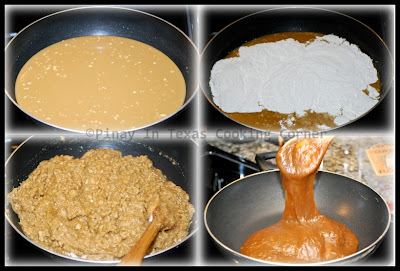 Flatten the top with a piece of banana leaf or a greased spatula. 4. Serve plain or sprinkle with latik or sesame seeds on top. I love it with toasted pinipig! Looks like I wasn't the only one who got satisfied! This looks silmilar to our Malaysian 'dodol' except we don't have the extra bits on top. We seem to have influences of each other in many of our foods. Looks so chewy good! I agree with ping, we don't add vanilla essence too.We use palm sugar. Che meraviglia Tina!!!! Come sempre una ricetta molto buona. That's the real deal kalamay. I wish I could have a slice. I don't have enough patience to make kakanin. I never knew kulangot was kalamay. It is quite revolting. This one is new to me, but I suddenly have a craving for it now! @Nami: Pinipig is actually freshly harvested glutinous rice that is pounded into rice flakes.In the Philippines, we frequently use it as topping for most Filipino sweet delicacies. @Manu: That is so true! I find it so amazing to be able to make the treats I used to love when I was little! Nice Tina, similar to our dodol over here. It sure looks delicious, and mouthwatering! Thanks for new recipe, new to me! Great photos too!!! Thank you ma'am Tina for this delicious blog. God bless you! Looks yummy. I tried to make kalamay before but i got tired of stirring it so I used hand mixer I ruined my non stick pan. I will do this one again looks so yummy.